I've just been running my 2x Horizon Express and one of the magnets has almost no clutch power, it can't even tow 2 carriages. the only way I could run the train at all was with the power car at the rear. Anyone else had problems with magnets not 'clutching'? I have been having exactly the same problem on my Horizon Express, the only solution I have found as of yet is to push the two sections together quite hard, which seems to work for me. I have no idea why the clutch is so weak though. Sounds like you have some bad magnets. I think they sit loosely in the housing and spin around to find the correct polarity. Try shaking them a little in case the magnet got stuck and is not finding the best orientation for a good connection. They are capable of pulling a lot more. tried shaking them, does make a difference but only temporarily. I've also noticed that I have this problem on 2 of the 3 connections in the horizon express, not just 1 as I previously thought. I have not been picking up many trains over the last couple of years, how long have these newer magnets been around? I believe on the Hogwarts Express in the video above older magnets are used, which seemed to be much more effective. You know, one reason the new-style magnets have a stud on the top and bottom is so that you can use 1x2 plates or tiles on either or both sides to hold them together if their magnetism just doesn't cut it. That's the simplest solution in my opinion. I reckon its some time between 2006 and 2010, because the magnets on 7897 are very powerful and do the job nicely, whereas those on 7939 don't seem to be as good. The ones on the Horizon Express are in a different league of ineffectiveness though. Maybe the Hogwarts Express shown above used the '1x2 to hold it together' method? When my train magnets get weak, I take a really powerful magnet (which I keep on my refrigerator), stick it to the train magnets for a few seconds, and they are good to go! It's definitely something related to this. I was in a Barnes & Noble one time recently and saw some type of toy-- might have been one of those Mega Bloks Halo figurines with the magnetic joints-- that included magnets. No joking, nearly half the front of the box was covered in warnings. Needless to say, it seems like safety considerations involving magnets are a much bigger deal than they once were. I've never been a LEGO train enthusiast myself, but I do have some nostalgia from growing up in the 90s when magnets were conspicuous in various themes, most prominently Space and Aquazone. Still, I can recognize how if TLG wants to maintain a reputation for safety, they would be strongly motivated to avoid any magnetic components in their models that would necessitate so many safety warnings. But in the meantime, as I said, the new train couplings have studs above and below so they can be joined by 1x2 plates and tiles. So really I think LEGO train fans probably got the better deal, all things considered. There's no telling when LEGO Space might see magnetic functions return in any form, since train couplings don't work very effectively for the kinds of function that genre tended to favor. Permanently fixing the couplings would probably work OK for the Horizon Express, since it's only ever likely to be used as one unit. Actually I was thinking of changing the middle carriage coupling to a shared bogey anyway, since that's how it's meant to be, so I might just do that and use the 1x2s on the other 2 joints. I'd prefer the magnets to work better though. I've high-speed tested the 7897 magnets (by attaching to the TGV) and they hold together fine even under very sharp deceleration, so it does seem possible to have magnets that work. The 1x2 plate method wouldn't work so well for wagons, it would make shunting a real pain, so I've ordered a magnet to 'power them up' with and will see how that works on the freight wagons (some of those also have weak magnets). I'll probably try it on the TGV as well, just to see if it can be solved. I've ordered one of these, do you think that would do it? I guess misalignment might also have been a problem, I can't check now as I had to pack them all away (can't hog the floor for ever, it was just a special treat for my son as he's ill). 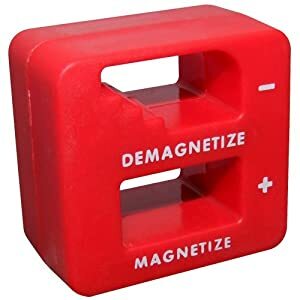 I did try and connect a lot of times though, and I tried shaking them, so although misalignment might account for the inconsistencies in a single magnet, there does also seem to be a fundamental lack of magnet power. I'll certainly 'wiggle' them next time I try. Maybe sourcing older magnets might be another solution. ^ Will it work? No. That won't make any difference to an existing magnet. That is for weakly magnetising a screwdriver, enough to pick up a small weight (a screw) to hold it while screwing it in. You'll be better off getting some rare earth / neodymium magnets, cracking the parts open, and replacing them. I won't crack open the magnets for safety reasons - don't want my son to end up swallowing them, it's pretty nasty. Oh well, no problems about the magnetiser, it was only £3 and I can use it to magnetise my screwdrivers. I was just going on what @beatlefan1966 said about powering up the magnet. Maybe something more powerful then.